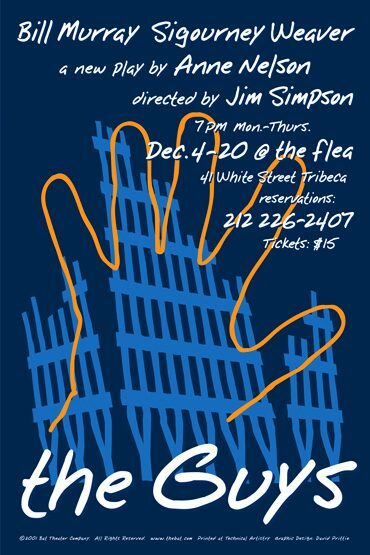 On Tuesday, December 4, the Flea Theater will begin a series of workshop performances of a new play, The Guys, directed by the Flea’s founder Jim Simpson. It will feature Sigourney Weaver and Bill Murray in the two roles. The play was written by Anne Nelson specifically for the theater. The play is a dialogue between a fire captain who has lost most of his men in the September 11th attack, and an editor who helps him write the eulogies as she struggles herself to come to terms with the event. The Flea Theater, one of New York’s leading off-off-Broadway repertory companies, has itself suffered drastically from the September 11th events. Over the past five years, The Flea has served as a thriving performance space for music and dance performances as well as innovative theatrical presentations. But it is located seven blocks from Ground Zero. In the week preceding September 11th, The Flea was hosting an active repertoire of 5 plays, two dance presentations and a concert, 17 performances weekly. After September 11, all activity ceased. When the neighborhood reopened two-and-a-half weeks later, audience attendance plummeted from 90% to 5%. Audiences have been unable or unwilling to venture into the affected zone- until recently, dust and ash from the debris still hung in the air. The genesis of The Guys has been unique. The project was launched by the comments of one of the young actors in the repertory company, who asked Simpson to try to find a work that addressed the September 11th tragedy directly. Simpson reviewed classical and traditional repertory, but could not find the right piece. A few days later, he happened to be seated next to writer Anne Nelson at a benefit dinner for a human rights organization. Nelson, who teaches at the Columbia Graduate School of Journalism, had never written a play before, but she agreed to try to weave various experiences and ideas relating to the attack into a play that would address the theater’s needs. The Guys was written over the midnight hours in a little over a week. Simpson scheduled it two days later. The day after that, Sigourney Weaver – Simpson’s wife – expressed interest in playing one of the two roles, and recruited her friend Bill Murray to play the other. The Guys continued the theater’s tradition of outreach to the New York community, and its ongoing emphasis on the idea of artistic expression that is timely and connected to the lives of the public it serves. Since its founding in 1996, the Flea has presented 36 plays and over 70 music and dance performances. It also offers workshops and training and rehearsal facilities for young artists from many different disciplines. Director Jim Simpson is the Artistic Director and Founder of the Flea Theater. His New York credits include the Kabuki play, Benten Kozo, Nixon’s Nixon, Christopher Walken’s Elvis play “Him,” and others. He has received two Obie awards for Direction. Anne Nelson is the author and editor of several books on international affairs, as well as numerous articles. She won the Livingston Award for international reporting, and previously served as the director of the Committee to Protect Journalists. Bill Murray has been around a while: “Saturday Night Live,” then movies — some unavoidable — “ Caddyshack,” “ Ghostbusters,” “ Groundhog Day,” “ Hamlet,” “Rushmore,” “ Hamlet.” He did “A Man’s A Man” for Tim Mayer. Currently, his prizes are his wife and sons. Sigourney Weaver started her career Off-Broadway doing new plays. She went on to work in films including “Alien,” “ Working Girl,” “ Gorillas in the Mist,” “ Heartbreakers” and of course “Ghostbusters” with Mr. Murray. The Guys marks her return to Off-Broadway.